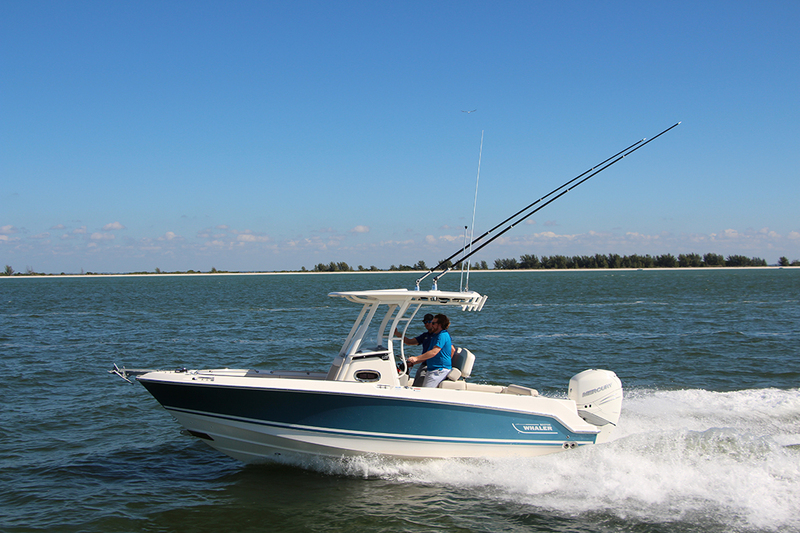 New for 2017, Boston Whaler has introduced the 230 Outrage—effectively replacing the 220. 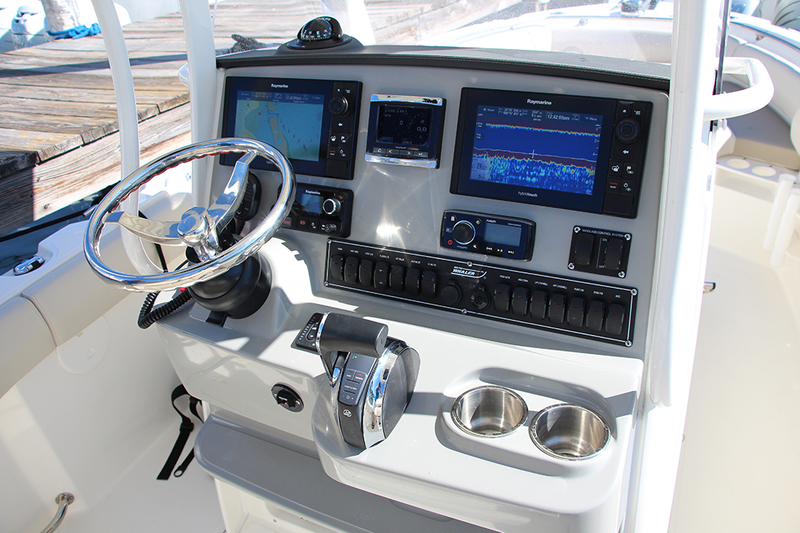 It’s a single engine fishing and cruising machine that stays true to Whaler DNA, while adding some new features. Of course it has the unsinkable foam-filled hull that makes it a solid and quiet ride. The hatches and handles are sturdy and well-built with quality materials. Though this is a trailerable 23-foot boat, it is more than ready, willing and able to handle big water. 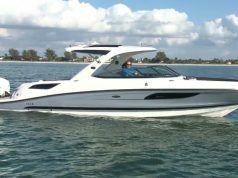 With the 350-hp Mercury Verado, the 230 Outrage can cruise all day in the 30-40 mph range and hit a top speed of 54 mph. Though powered with a single engine, the hull design and strakes do their jobs well, getting the boat on plane in less than six seconds. Handling from the centre console layout is precise and turns are crisp and tight. The powder coated optional T-top with grab rails will get good use by passengers standing aside the captain. For those who want to sit, the captain’s chair/leaning post is solid and features a cooler beneath. 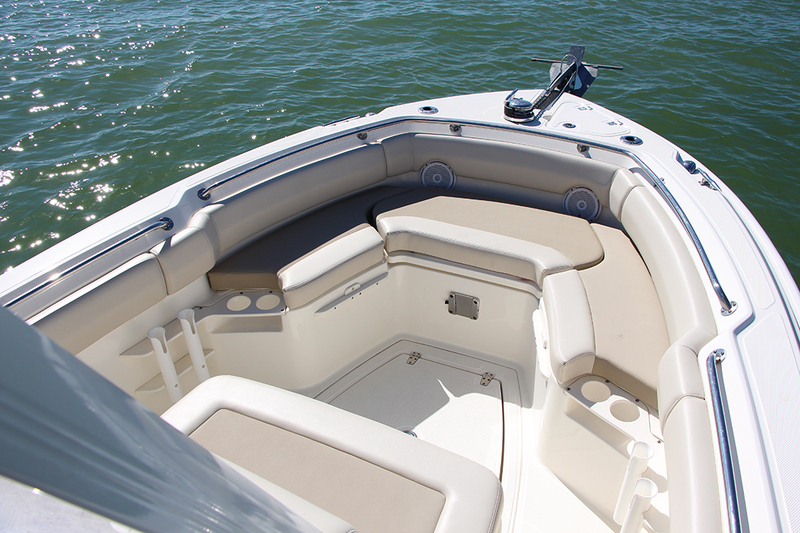 At the bow is a forward facing lounger wide enough for two and wraparound bow seating. It features the new notched-bow design that pushes the beam of the seating area out a few inches to make a noticeable difference in seating space. 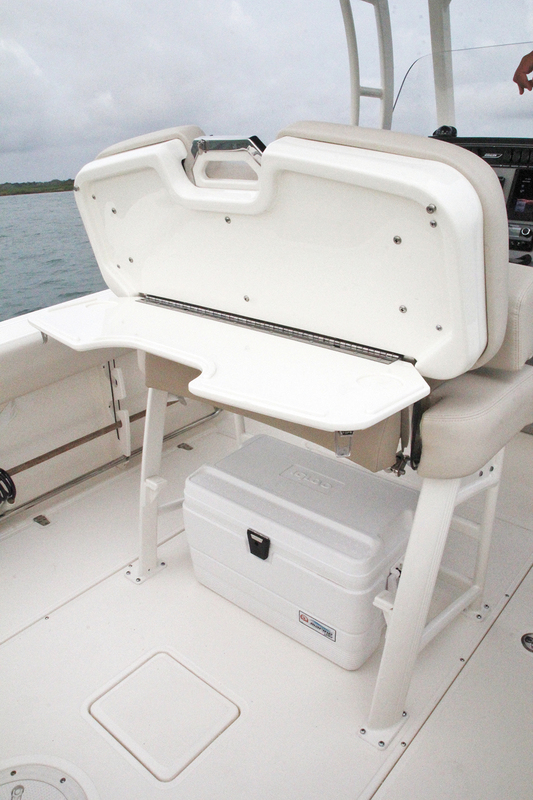 At the stern is a clever and solid hide-away bench seat and, on the back of the leaning post, is a fold down table for prepping bait. When secured away, it folds down from the captain’s backrest to rear-facing seat. Of course fishing is a big part of the Boston Whaler appeal and the 230 Outrage packs a mighty punch in this size of boat. With the optional T-top come rocket launchers and outriggers for serious offshore fishing. There are rod holders in the bow that double as sunshade posts and rod holders and storage midship and at the stern. To find the perfect fishing conditions and spot schools beneath you there are a variety of Raymarine multifunction display packages to choose from. As tested, we had dual HybridTouch units. To keep your catch fresh, there are standard in-deck fishboxes with overboard drains and compression latches and a 16-gallon livewell. It’s not the cheapest 23-footer out there, but you definitely get what you pay for with the 230 Outrage in terms of performance and quality. This is as good of an all around boat with big water fishing and family cruising capabilities as you will find in this size range.